Only 77 Days To "Truck Day"
The Red Sox traded with Milwaukee for right-handed reliever Burke Badenhop. ... Prospects Garin Cecchini (3B), Bryce Brentz (OF), and Anthony Ranaudo (RHP) were added to the team's 40-man roster. What was the Most Watchable Game of 2013? Dave Studeman at The Hardball Times says it was the July 30 game between the Rangers and Angels. Studeman ranked every 2013 game "by the total number of swings in Win Probability as well as the average Leverage Index of each play. In non-geek speak, these games featured the biggest swings in leads along with the most intense, close plays." ... Top Red Sox game? June 10 at Tampa Bay. 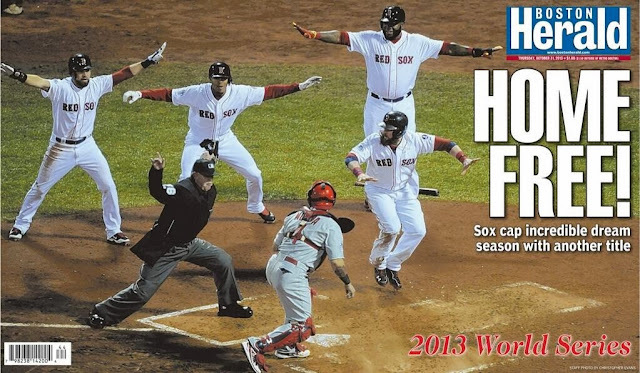 The Official 2013 World Series DVD is scheduled for release on Tuesday, November 26. You can see a short trailer here. Consumer note: Don't buy anything until the World Series DVD box set comes out the following week, on December 3. There appears to be eight discs - which probably means the six World Series games, a disc of bonus stuff, and the official WS DVD mentioned above. If I'm right, then MLB is hoping to get you to pay twice for the same stuff. My 2004 Book: "Don't Let Us Win Tonight"
Commemorating the 10th anniversary of the Boston Red Sox' unprecedented championship run in the fall of 2004, this guide takes fans behind the scenes and inside the dugout, bullpen, and clubhouse to reveal to baseball fans how it happened, as it happened. 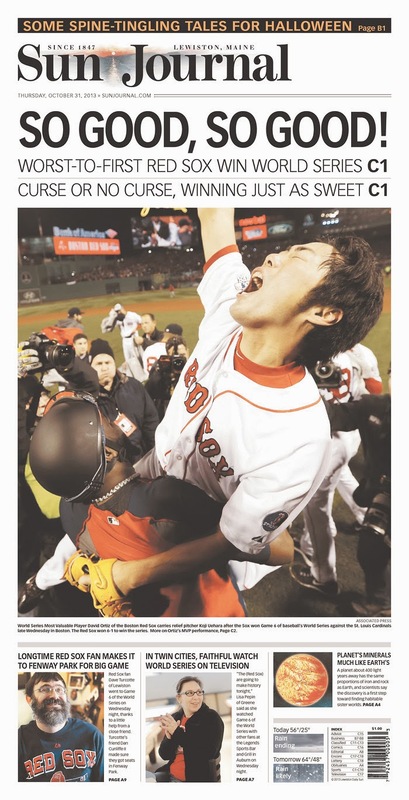 The book highlights how, during a span of just 76 hours, the Red Sox won four do-or-die games against their archrivals, the New York Yankees, to qualify for the World Series and complete the greatest comeback in baseball history. 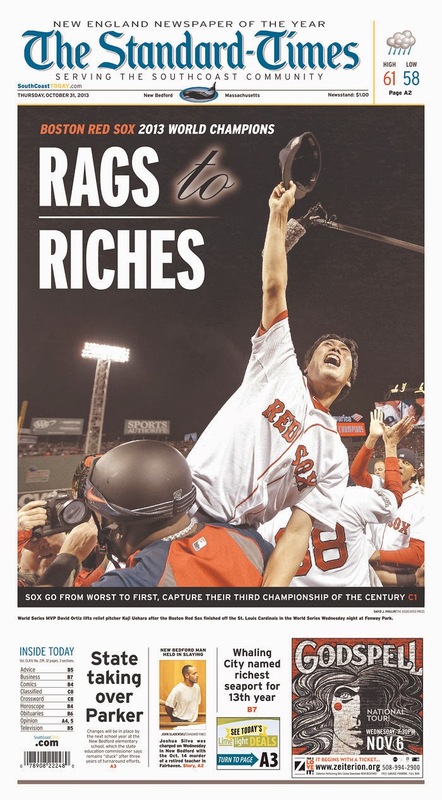 Then the Red Sox steamrolled through the World Series, sweeping the St. Louis Cardinals in four games, capturing their first championship since 1918. 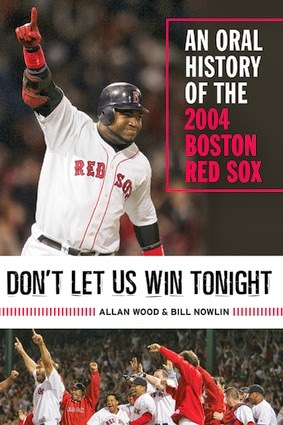 Don't Let Us Win Tonight is brimming with revealing quotes from Boston's front office personnel, coaches, medical staff, and players, including Kevin Millar talking about his infectious optimism and the team's pregame ritual of drinking whiskey, Dave Roberts revealing how he prepared to steal the most famous base of his career, and Dr. William Morgan describing the radical surgery he performed on Curt Schilling's right ankle. 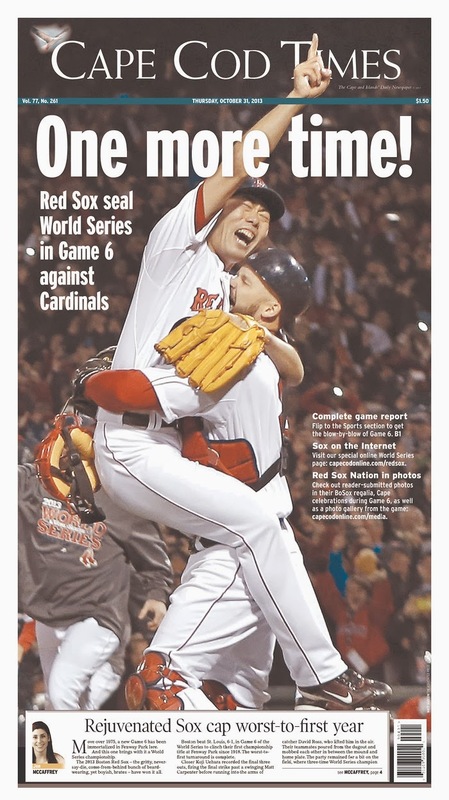 The ultimate keepsake for any Red Sox fan, this is the 2004 team in their own words. Don't Let Us Win Tonight is scheduled for release on April 1, 2014. It's difficult to imagine anyone writing a more thorough biography of Smoky Joe Wood than what Gerald C. Wood (a possible, though extremely distant, relation) has produced. Despite its many good points, this book is also flawed. The first 25 pages of the book detail the life of Smoky Joe's father, John F. Wood, a fascinating character in his own right. John F. – both stubborn and eccentric – was a "lawyer and two-time newspaper editor, as well as a politician, gold rusher, chicken farmer, wood- and metal-worker". John F. also worked as a schoolteacher (his wife was a former student) and as a land speculator. Joe always expressed pride in his father, but Gerald Wood concludes that "Joe's defensiveness toward John masked the hurt of a boy orphaned twice by his father's lust for gold". Howard Ellsworth Wood was born in October 1889, the second of three children, in Kansas City, Missouri. Wood explains how Howard Ellsworth became "Joe". While living in Chicago, the family attended the World's Fair in 1893. The antics of two performing clowns (billed as "Joey and Petey") reminded Joe's parents of their two boys and they began calling them Joe and Pete. 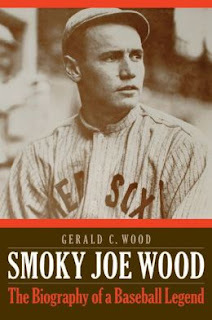 The book's most serious problem is Wood's insistence on mentioning every game Joe pitched and giving his pitching line and (sometimes) a little play-by-play. This excessive detail bogs down what should be a lively narrative. I found myself skimming these sections – one minor league season run seven dense pages – or simply skipping ahead to where the story picked up again. Also, Wood offers few looks beyond Joe's performances. The reader often has no idea who else on the Red Sox is doing well (or poorly), where the team is in the standings, or what else is going on in the American and National Leagues. Also, Wood puts undue importance on Joe's win-loss record as a measure of his success, and when ERA is mentioned, it is usually only at season's end. Joe's beginnings in professional baseball are expertly recounted. If Joe felt abandoned by his father, he found a surrogate family on the diamond. Wood writes that Joe "filled the void [left by his father] with baseball. Joe's success on the town team offered acceptance and prestige while his father roamed the Southwest, trying to get rich quick." Baseball was always a refuge for Joe. "I don’t know of anything that I’d rather have done," he told one interviewer. "Baseball is all I ever wanted." In 1912, the Red Sox moved from the Huntington Avenue Grounds to brand-new Fenway Park – and Joe had the finest season of his career. He led the major leagues with 34 wins and had a 1.91 ERA (2nd best in the AL). Joe also led the league with 10 shutouts, including a 1-0 victory over Walter Johnson in a much-hyped duel in Boston on September 6. In late August, Boston Post writer Paul Shannon first used the “Smoky” nickname that would stay with Joe for the rest of his life. After Joe bested Johnson, other papers picked up the nickname. Although supremely talented, Joe was often injured. In 1913, he sustained a sprained ankle in spring training and a fractured thumb during the season. Joe pitched with excruciating pain in 1915, likely from a torn rotator cuff. He sat out the 1916 season after being disgusted by a one-third cut in pay and the trading of his friend Tris Speaker to Cleveland. Unable to pitch and desperate to remain in the game he loved, Joe transitioned into an outfielder after the Red Sox traded him to the Indians. He finished 10th in batting average in 1918 and was among the league leaders in doubles, RBI, and slugging percentage. In addition to playing both left and right field, he also played 19 games at second base. Over the next two seasons, Joe platooned in the Cleveland outfield with Elmer Smith, with Joe playing against left-handers. In 1920, Cleveland overcame the shock of Ray Chapman's mid-August death to win the pennant and defeat the Brooklyn Dodgers in the World Series. Wood retired from baseball after the 1922 season to spend time with his wife and four children and also for the security of regular, long-term employment. He accepted a coaching job at Yale University, a position he would hold until 1942. The book offers details of the gambling and game-fixing scandal that enveloped Joe in 1926. In the spring of that year, Dutch Leonard told AL president Ban Johnson that Joe had conspired with Speaker and Ty Cobb to bet on and fix a Tigers-Indians game late in the 1919 season. Joe admitted placing a bet and collecting his winnings. Although Commissioner Landis declared the accused not guilty of fixing a game, he was completely silent on the betting issue. The "Legend and Legacy" chapter offers an excellent overview of Joe's career, along with his thoughts on all aspects of the game and its history. This is the type of entertaining recap that was sorely needed in other sections of the book. Gerald Wood also includes a bit of trivia: Joe and Babe Ruth are the only players to have 300 innings pitched one year and 500 at-bats in another. They are also the only two players to start a World Series game as both a pitcher and an outfielder. This review originally appeared in the November 2013 issue of "The Inside Game", SABR's Deadball Era Committee's newsletter. Dustin Pedroia will have surgery next Tuesday to repair a torn ulnar collateral ligament in his left thumb. 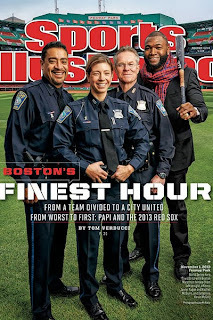 David Ortiz is on the cover of the latest issue (November 11) of Sports Illustrated with three Boston Police officers. ... Nice SI.com headline: "AL East Hot Stove Preview: Red Sox Threatening To Leave Rivals Behind"
Quintin Berry and Brandon Snyder have both been moved off the 40-man roster and outrighted to Pawtucket. Both players rejected the assignments to AAA, however, and are now free agents. 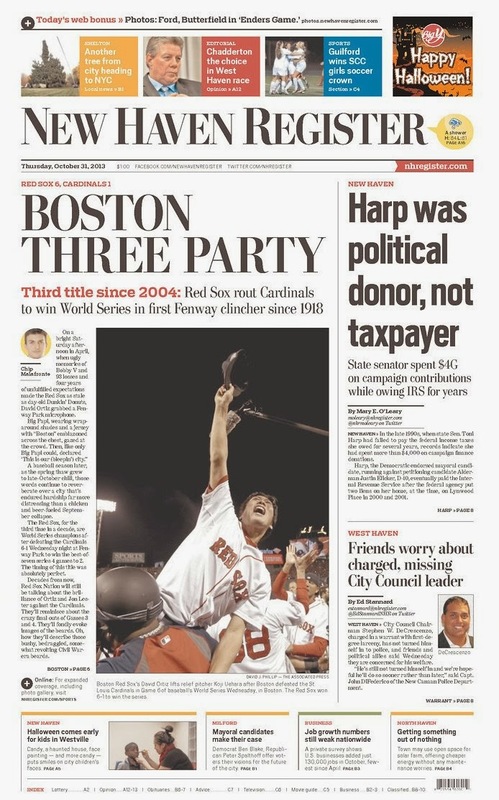 For Ben Cherington and John Farrell, it's back to work. 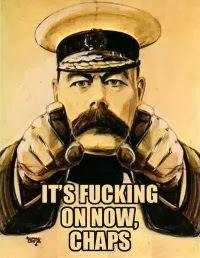 Farrell: "The game doesn't stop. The baseball calendar doesn't stop just because we played till nearly Halloween. I think we take on this next challenge and look to address it the best we can, and that is, assemble the best team possible, continue to know that we have good young players coming and in time, we're definitely going to be eager to get on the field in Fort Myers again. ... We have to get back to the mindset we took to the field Day 1 with this year and look to build that through the entire season next year." Ortiz was on the David Letterman Show Monday night. ... Jonny Gomes and a clean-shaven Shane Victorino appeared on Conan O'Brien last night. Other Conan clips here, here, and here. Pictures from the rally! ... More here. 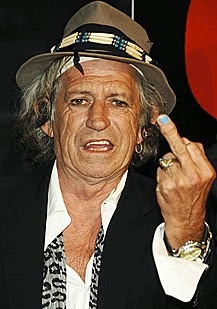 ... And here. ... And here! It begins at 10 AM. ... Live coverage (or here). The Red Sox have exercised their $13 million option for Jon Lester for the 2014 season. 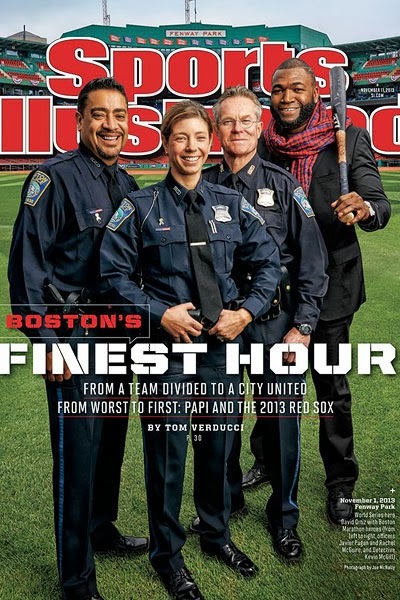 And you thought it couldn't get any worse than McCarver? 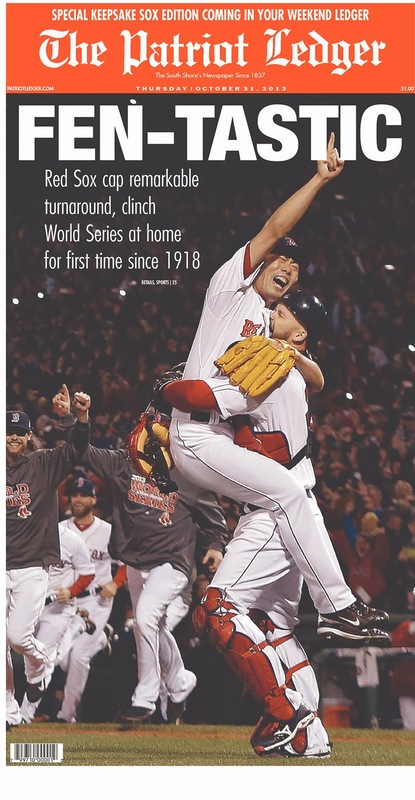 * Speaking of curses: A lot of people, it seemed, were trying to make a big deal out of the fact that this year was the first time that the Red Sox had clinched a World Series AT HOME since 1918. Television made it seem like the overriding story of the Series. 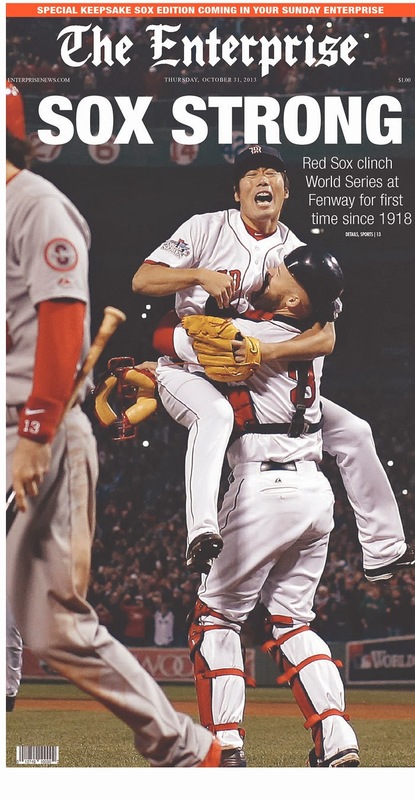 The "clinch at home" angle seemed to give everyone a chance to trot out all the old curse talk, rehash the Babe Ruth trade, chat up all the old Red Sox fans who have been coming to the park for decades and had never gotten the chance to see a World Series clincher. 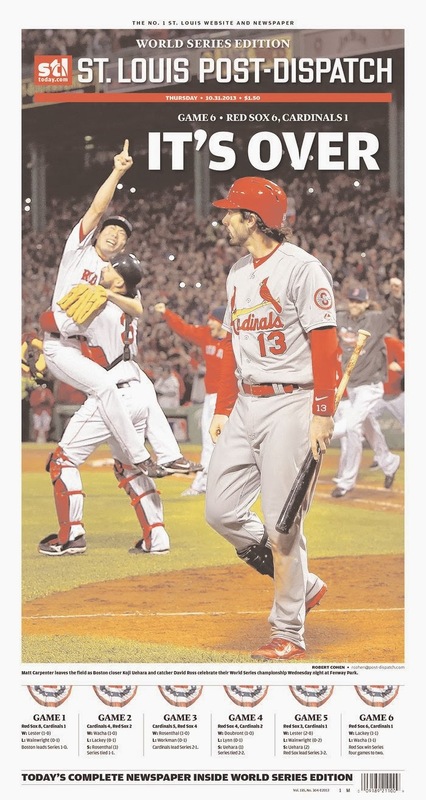 Seriously – clinching a World Series at home is a thing now? It's not enough to just win two World Series in the previous eight years, not you have to win it at home for it to really count? 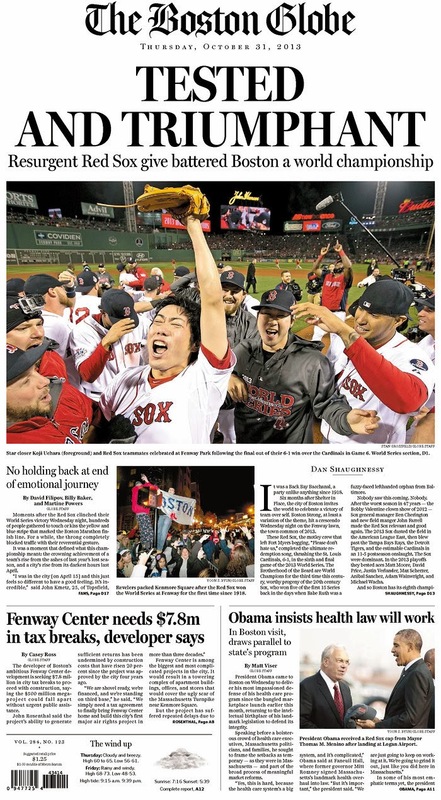 I mean, look, it's great that a wonderful town like Boston got to win the World Series in a wonderful park like Fenway. Happy that it worked out that way. 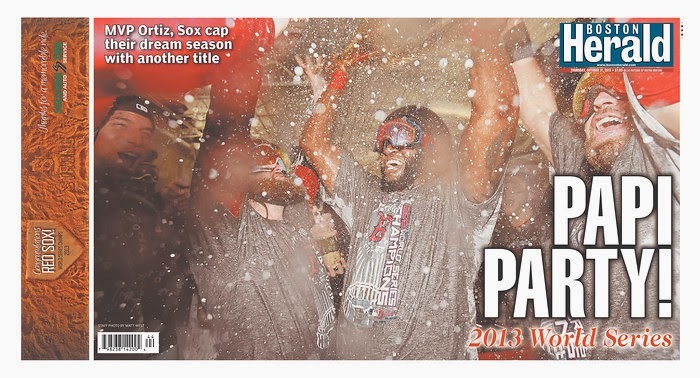 It was great to see Red Sox fans get to unleash their happiness. 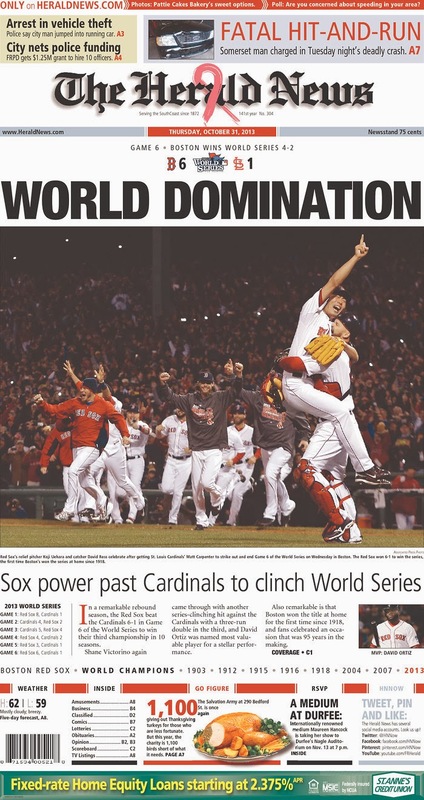 But I believe, and my Red Sox friends seem agree — not winning a World Series AT HOME is not a thing. It's not a curse. It's not a drought. It's not anything. If you win a World Series you win a World Series, it doesn't matter where. The Chicago White Sox have not clinched a World Series at home since 1906. 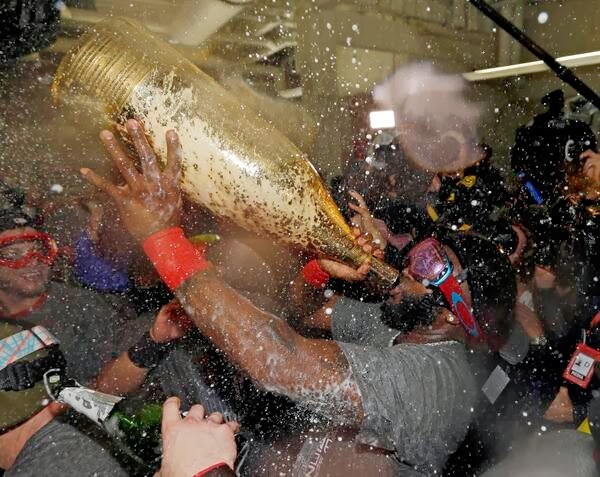 The Reds did not clinch either of the Big Red Machine World Series at home. Those poor Giants fans have never clinched a World Series in San Francisco. So what? 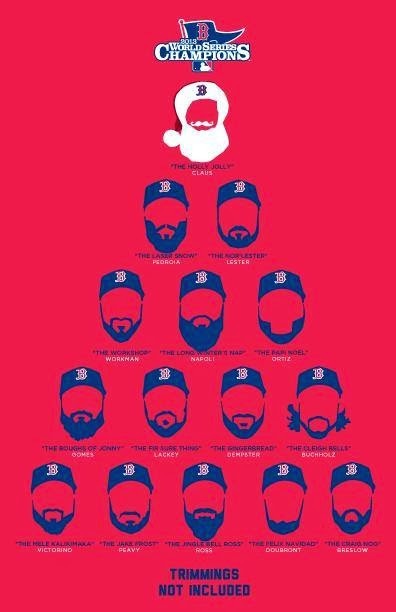 The Red Sox don't have a losing tradition anymore. It's over, you can't just keep bringing it up like it's a storyline. 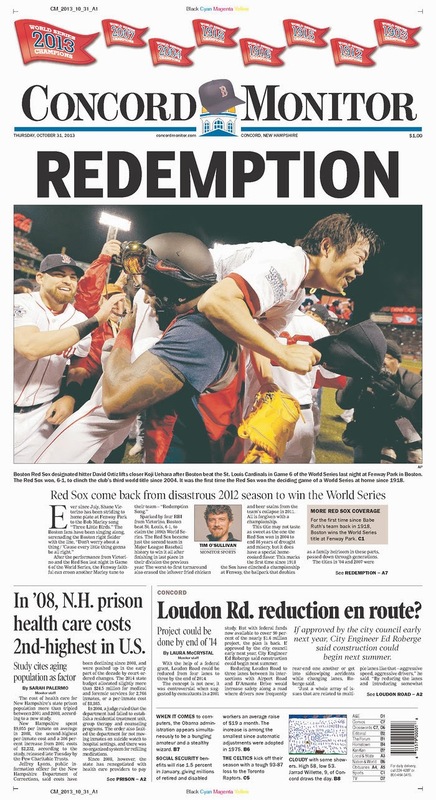 The Red Sox have won three World Series in 10 years. It's time for everyone to just deal with being Boston being Goliath. 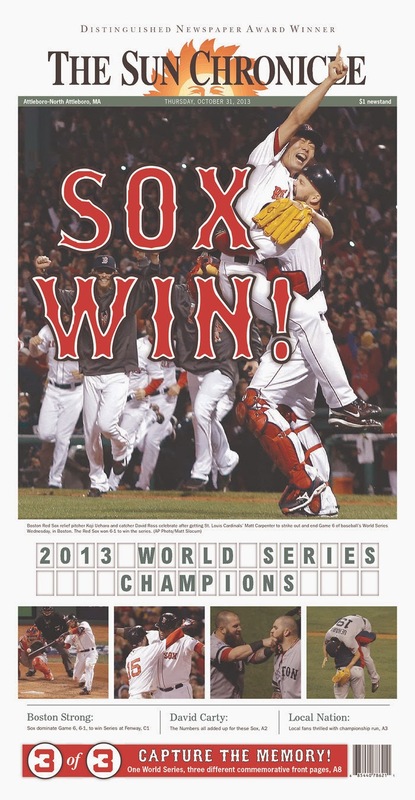 Boston has clinched five of their eight World Series titles in front of their home fans (1903, 1912, 1915, 1918, 2013). That's 63%. Of the Yankees' 27 World Series championships, only nine were clinched in New York (1927, 1938, 1947, 1950, 1951, 1977, 1996, 1999, 2009). That's a paltry 33%. The 2013 Boston Red Sox went worst-to-first in the American League East, going from 69-93 in 2012 - their worst finish in 47 years - to 97-65 this year. But they did far more than that. 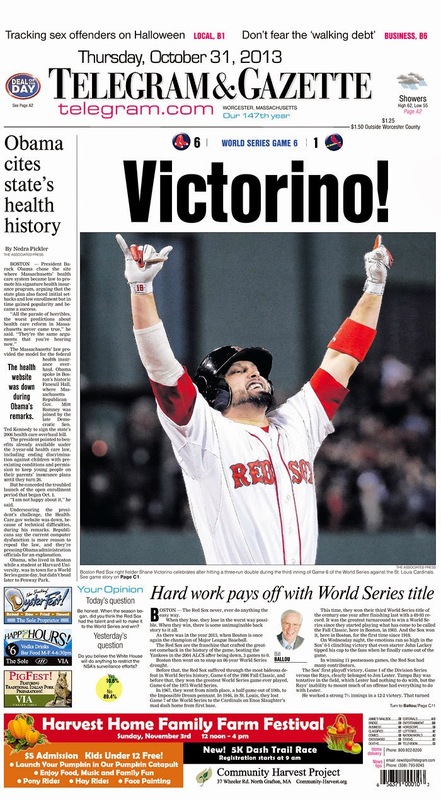 The 2013 Red Sox completed the biggest turnaround season in baseball history, because no other World Series champion had a winning percentage the year before as low as Boston's .426. You can call it luck, you can call it magic, you can call it a sense of purpose or determination or alchemy or chemistry -- but know that it was something. Make no mistake -- talent wins. And the Red Sox compiled a roster of players with established track records that represented the sort of skill sets the team believed would contribute to the restoration of some (unknown) degree of success in 2013. But by their own admission, they didn't expect THIS. WEEI's Conor Ryan presents the Top 10 Plays of the 2013 World Series. Two things bugged me about Simmons's article. One, Simmons says he found it "fascinating" that fans at Fenway were expecting a comeback in ALCS Game 2 even before the rally that culminated in Ortiz's grand slam began. Why is that "fascinating"? The team had been coming back in games all season long. Wasn't Simmons paying attention? Larry Lucchino says the core of the 2013 champions will remain next season. One player that many observers think will not be in a Boston uniform next spring is center fielder Jacoby Ellsbury. According to a report from Fox Sports' Ken Rosenthal, Red Sox center fielder Jacoby Ellsbury will have an MRI on his left hand after playing through the injury in the postseason. Ellsbury's hand was discolored and severely swollen up to the forearm, the report indicates, leading to surprise from teammates that he was still playing. OTM picks up the story from there.